The Seca 210 Measure Mat is the simple and quick way to measure a baby's growth from day one. The mat's soft touch and lightweight rubber of the Seca 210 infant measuring device is gentle enough for baby, yet portable enough for easy storing and durable enough for wall mounting. 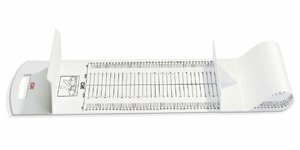 The Seca 210 Measure Mat is extremely handy in delivery rooms where newborns are measuring upside down. Seca did not have to substitute function for form on the Seca 210 Measure Mat. This infant measuring device offers accuracy and durability for many years to come.